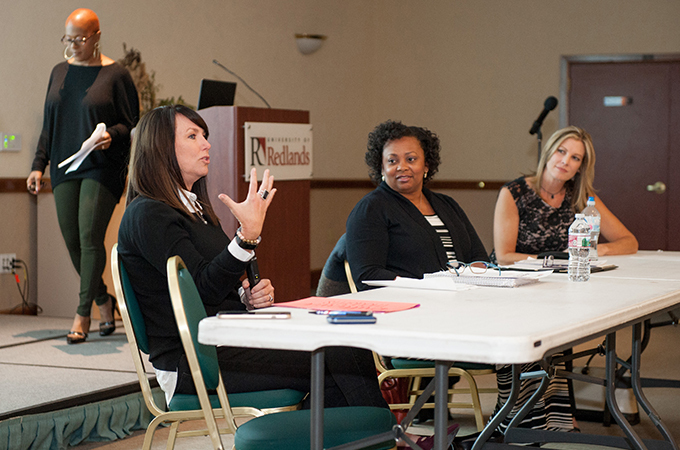 On Tuesday, November 13, four representatives of the Network of Executive Women, a nonprofit group focused on advocating for women and improving workplaces, came to the University of Redlands to talk to us about how to navigate the world of work. As I sat down in the Casa Loma room, I wasn’t sure what I was going to get out of this conversation but I was excited to find out. The women who joined us were Vicki Goizaueta, Lara Gallistel, Marilyn S. Locus, Esq., and Melanie Bauman. Goizaueta, who worked in Human Resources, led the conversation by asking each of the other panelists questions. While their stories varied, they had hard work and determination in common. Gallistel, a mom who worked full-time after taking a few years off to raise her sons, said she loved her job and was extremely happy to be back at work; Gallistel now works as a director at Old Trapper Smoked Products. Locus, a director of Human Resources who has worked for various Fortune 500 companies, said she believed that “management is truly fostering a positive environment in a workplace.” Finally, Bauman, who received her Bachelor of Science in international business from Cal State Fullerton and spent 16 years of her career at Ralph’s, was working as the vice president of integrated media at Valassis. The women talked about a plan of action for gender equality. They laid out four areas of focus: disrupting gender bias in status quo cultures, making workplaces more inclusive and supportive, better understanding the decisions women must make during life and career pivot points, and offering solutions to help women navigate these events. Each of the four panelists was able to share stories about times they were the only woman, or one of few women, in a room of men and how intimidating and uncomfortable that felt. Locus commented she knows sports and it would always shock the men she could “talk sports” with them. Similarly, Bauman stated she was hired to be a sort of mediator; the first 10 minutes of conversation at every meeting she attended are centered around sports and she was the one expected to get meetings started on the right path. She added, though, she is willing to take her time as the only woman in the room. She knows she needs to show who she is and what she can contribute to her work environment. The women also made it clear that social media is an extremely important avenue for business. Although it can be a blessing and a curse, social media is a great way to stay connected. They encouraged us to stay connected to previous employers and mentors, even if we just send a message on LinkedIn every once in a while. In addition to advocating geographic flexibility, the panelists encouraged us to seek out professional mentors in our fields. Having a professional mentor provides someone you can go to for business and career advice to help you figure out the best decision for YOU. As a whole, the conversation helped me understand the workplace in a way I hadn’t before. It made me think about the struggles that women face daily and the fact we really are still fighting for gender equality. I also learned a lot about what I can do now and in the future to help with my career and life in general. I know women are smart and powerful, and the women of the Network of Executive Women reminded me of all we are capable of.